HAKI Universal is the scaffolding solution that has the speed to keep up with the fast moving pace of construction. 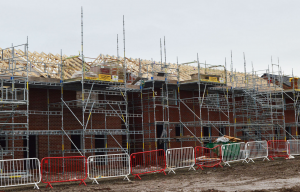 Scaffolding contractor Interserve used HAKI Universal System Scaffolding to meet the needs of Taylor Wimpey. HAKI Universal can be erected and dismantled 60% faster than tube and fittings and at least 30% quicker than other systems. The adaptability of the system enables horizontal and vertical off node connections to be made anywhere along the ledger. This allowed Interserve to build a scaffold to suit the irregular shapes of housing projects using the larger 3m bay length.